The dam was still standing in the 1980's as I fished around it as a boy. My friend's grandmother lived in one of the mill houses until she was relocated when the reservoir was built. Is this the same Orange factory Road that runs up into Bahama? Hello. I am a regular local reader of your blog. Do you have any further information about William H. Willard or the Willard Manufacturing Company? My father does extensive genealogy research on the Willard name, and we're wondering if he came to the area from Yadkin County and/or Prince Edward County, Virginia. The Durham County Public Library has a few books related to the history of Orange Factory, including a 1978 booklet by John Baxton Flowers, III. In it are some nice pencil drawings by Jacob Roquet. The bird's eye view of the village was helpful to me. I visited the site a year and a half ago (during the most recent drought) and was hoping to find that the receding waters of the Little River Reservoir had exposed a portion of the old factory foundation. No luck. Still, from the drawings it looked like quite an impressive structure. I recall in the mid-70's that the grist mill still had the millstone in the mill building still in place. I grew up there, my great grandmother lived in one of the houses in the picture. It was a sad day when they burned those old houses, we really had good times growing up there. Orange Factory was established in 1852 (so named because it was the first factory in then-Orange County,) by John Douglas and William Lipscomb on the banks of the Little River. The Little River was one of the three rivers of now-North Durham County (the Eno, the Flat, and the Little) that drew settlement and the establishment of industry that utilized the water power that the rivers provided. Much of this settlement came east from Hillsborough, the county seat. The factory itself was first built as a frame structure, and the original dam across the Little River was made of wood as well. The mill was purportedly 94 feet high from base of foundation to peak of roof. The mill produced plaids, ginghams, ticks, tobacco bags, rope, twine, toweling, yarns, and thread. In 1859, Orange Factory post office was established. By 1860, the factory was producing 140,000 pounds of cotton yarn and employed 50 people, 30 women and 20 men. The factory utilized both water and steam to power its machinery. During the Civil War, 3/4 of the production was for Confederate government contracts; the factory produced Confederate military uniforms. Although Sherman rode through the town with his troops, the town was spared Sherman's 'total war' destruction because, to quote one of his soliders "there weren't nothin' there but just poor folk." In 1864, the factory was purchased by William H. Willard, who in turn sold the factory to SW Holman in 1873. A mill community, initially comprised of only 4 houses, grew around the town. 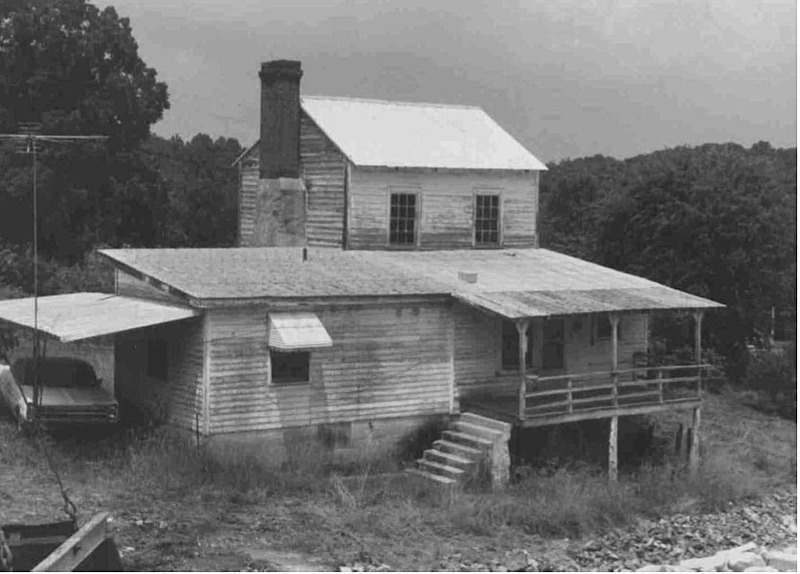 Approximately 24 dwellings were constructed, including a 20 room boarding house known as "the twenty house" as well as two general stores run by AG Cox and SW Holman, a schoolhouse, and Riverview Church served the mill village. WH Moise ran a tailoring store called "Billy Button." A grist mill was established that utilized the water power from the factory dam. By 1880, the factory had 42 looms and 1300 spindles; in 1887 Willard repossessed the factory, and renamed it the Willard Manufacturing Company. WC Holman was vice-president, and SW Holman was superintendent. The factory was producing rope, twine, hosiery yardage, and seamless bags from sweepings procured from the Pearl Mill in Durham. It may have been at this time that the original frame mill was replaced with a brick masonry structure, 3 1/2 stories with low-sloped roof, thick brick walls, and eight-over-sixteen sash windows. A smaller three-story wing projected from the west facade and a four-story tower was attached to the south side of the factory. In 1904-5, AG Cox took over ownership of the factory along with James Mason (after unsuccessfully trying to persuade Benjamin Duke to join him.) 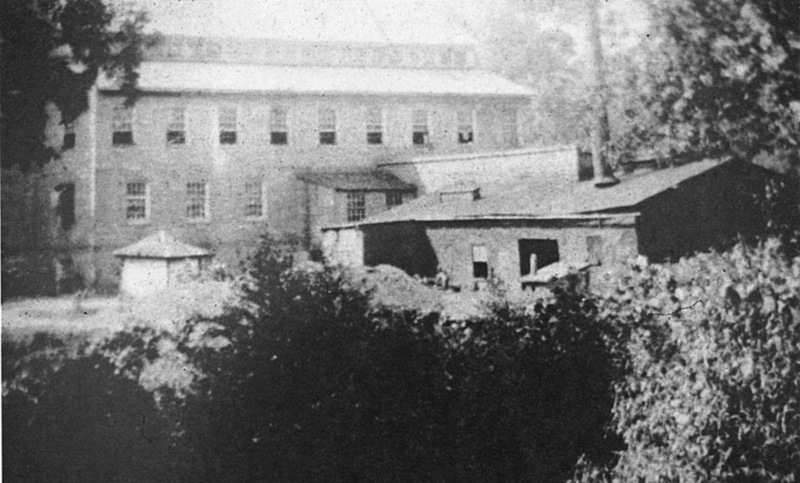 Mason moved to the former Lipscomb House to be closer to Orange Factory, which the pair renamed again, as Little River Manufacturing Company. This name wasn't to last long, as JA Long of Roxboro purchased the mill in 1916, and renamed it the Laura Cotton Mill, which made yarns and "striped convict cloth." In 1938, the mill was sold to the Roxboro Cotton Mill and was shut down. The community around it largely fell into ruins thereafter. Although the City of Durham had made plans to dam the Eno River for an additional reservoir, protests shifted their sights northward to the Little River. Plans were made to dam the Little River to create a reservoir that would submerge Orange Factory. 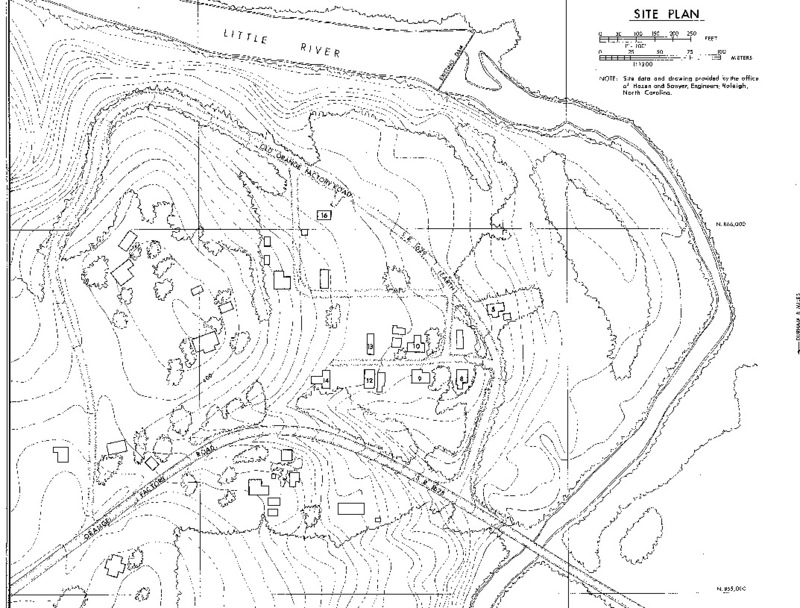 A study of the town at the time documented the remains of the old mill village. Map of Orange Factory, 1980. Houses on Old Orange Factory Road, looking east, 1980. The original Orange Factory Dam, 1979. 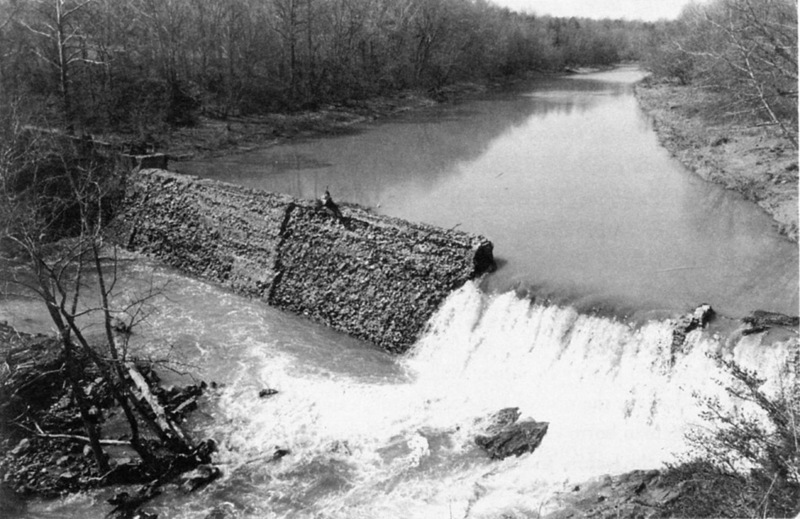 In 1983, the Little River was dammed to create an additional water supply reservoir in Durham County - flooding the site of the village and the original mill. Orange Factory house, early 1990s. 2-3 houses remained, although two were removed after Hurricane Fran badly damaged them. It appears that Riverview Church may be the only still-extant structure associated with the original mill village. Old Orange Factory Road, looking northeast, 02.07.09. The reservoir, and site of the town, 02.07.09.